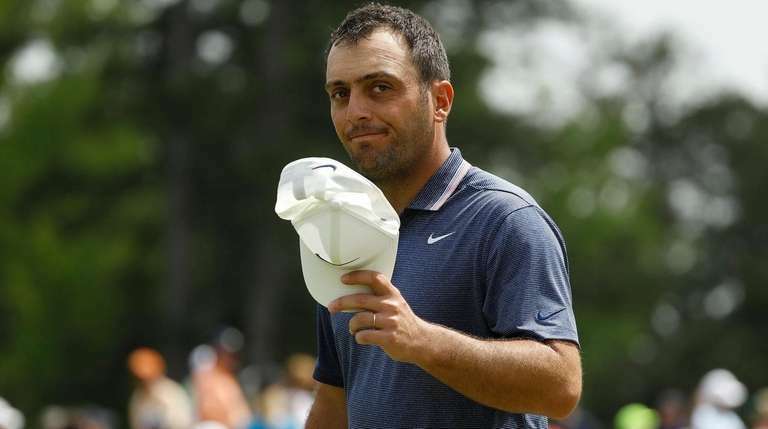 AUGUSTA, Ga. — It is entirely possible that Francesco Molinari soon will be able to say that he began his Masters career dressed in the white jumpsuit of an Augusta National caddie and graduated to a green jacket. So, he is impressed with the work of his own caddie, Pello Iguaran, who helped him win the British Open last July. On Friday at Augusta, the two of them together plotted strategy, read putts (especially a wild-angled downhiller on No. 18) and contributed to Molinari finishing the second round of the Masters at 7 under, tied with four others for the lead. All told, the day showed why Molinari quietly has become one of the world’s most dominant golfers. Molinari is not afraid to accept a challenge, having followed through on a childhood promise to caddie for Edoardo (nicknamed Dodo) should the latter ever qualify for the Masters. That became a reality when the older brother won the 2005 U.S. Amateur. Thus, there was Francesco, walking up and down Augusta’s steep hills in a group that included Tiger Woods. Francesco took on another challenge last year, jeopardizing his place on the European Ryder Cup team by choosing to play in the PGA Tour’s Quicken Loans National outside Washington D.C. rather than the European Tour’s French Open. He made the choice because he wanted to improve his standing in the FedEx Cup points race. He won the Quicken Loans and used that momentum to become Italy’s first British Open champion, holding off Woods in the final round. In the fall, he became the first European player to go 5-0 in the Ryder Cup. He is perhaps the best player in the world right now. He at least might be tied with Brooks Koepka as the best to receive little acclaim. “There’s obviously loads of great players in golf right now and you know, I think I’m getting the attention that I deserve,” Molinari said. “It’s not something that I seek or that I want desperately. Focus is what drove him to the gym to gain strength, having once played a British Open round with Dustin Johnson and Rory McIlroy and determining “I didn’t stand a chance really” because he didn’t drive the ball far enough. Focus is what convinced him to change his putting setup, path, tempo and putter shape. “Pretty much I could have started putting lefthanded, it would have been a similar process,” he said. Focus and a strong dose of imagination allowed him to lag a 75-footer from the back of the 18th green Friday, aiming it way left, off the fringe and allowing it to break down to the right. He rolled it within three feet, made the par and walked off with momentum for the weekend, happy that he only has to try to win the Masters instead of having to caddie in it.